Looking out on Mount Vesuvius from Sorrento has an infinite feel. The sun sets in perfect shades of pink and purple as one of the world’s most well known volcanoes appears to be glowing. While most backpackers base themselves out of Sorrento in order to see the Amalfi Coast, there is much more to see than just hopping a bus to Positano or sitting in Piazza Tasso in Sorrento. To Sorrento and beyond, activities abound from isolated ruins to cave hunting for your own private swimming hole. Time travel is possible just south of the Amalfi Coast. While most travelers stick to beaches in Sorrento and the jaw-dropping coastline, head a little bit further south and you won’t be disappointed. The ruins of Paestum stand incredibly preserved and intact. In the heat of summer, you can have much of this archaeological site to yourself for few know about some of the best-preserved temples from Magna Graecia. The ancient city was built for Poseidon around the 6th century B.C. As the sound of locusts fill the air, you can admire these UNESCO listed temples and feel as though you have stepped back in time. Here you can watch fisherman cast out for the day or laugh as children slip and slide on the boats still docked in the harbor. The buildings facing the harbor are somewhat run down, but they provide a nice respite from picture-perfect Sorrento. Old men give hairy-eyeballs at strangers from balconies above. Chat up one of the fisherman and see what is on the menu for dinner tonight. While most backpackers just take the bus to reach Positano and the other cliff carved cities, you may never get to drive on a road like this. Narrow and nail biting, a drive along this stretch (technically the SS163) is a once and a lifetime experience. Just don’t look down. However, Positano and Amalfi tend to get the most attention in the area. Without the crowds, head to Praiano, one town down from Positano. Weave down through the town on narrow passageways and join the party going on down by the water. If you are traveling with a group or a few friends, you may want to go in on a boat together. Capri, the island just off the coast from the Amalfi Coast may be best known for its Blue Grotto. While you have to go on rowboats to enter the famous blue cave, some rowing the boat will let you swim. If you are feeling like taking the horse by the reigns, hire your own boat or kayak and explore the different caves along the Amalfi Coast or on the Isle of Capri. 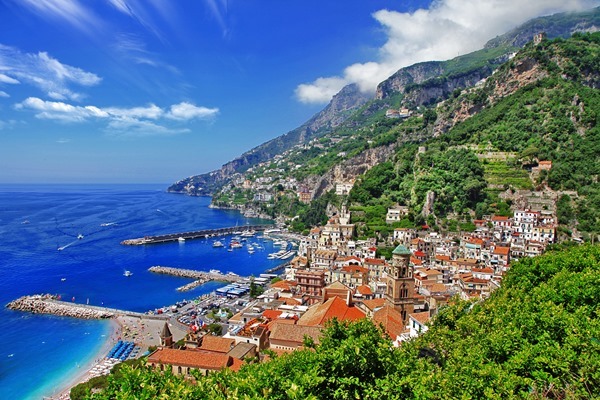 Sorrento is usually the foundation for a trip through Italy’s Campania region. While the seaside town lends surface level fun of shopping, eating, soaking up the sun and drinking, there is nothing like getting off of the tried and tested itineraries and paving your own way.